It was the first on-ice instruction session for Stars prospects at the Dallas Stars’ 2008 Development Camp and one player in particular kept catching the eye of former Stars’ defenseman Craig Ludwig, one of the coaches guiding the session. When Ludwig, now the assistant coach for the local Texas Tornado junior team, looked at the roster sheet to see just who that was in jersey number 36, he was a little surprised to find it was Scott Winkler, an 18-year-old center from Norway. The Stars selected Winkler in the third round (89th overall) of the Entry Draft on June 21 and he was getting his first taste of life as part of an NHL organization. It was a good first impression by a kid who just came over to the United States last year to skate for a Midget AAA team in the Kansas City area. Winkler was enjoying the development camp experience, particularly since he didn’t know if he’d even be chosen at all three weeks ago. While Winkler wasn’t as highly rated on some of the widely-circulated pre-draft player rankings, which was likely due in part to him playing in a Midget-classification league instead of the more advanced Junior leagues, the Dallas scouting staff sees a lot of untapped potential in him. Winkler himself was well aware where he was rated, so he was particularly excited to hear his named called. 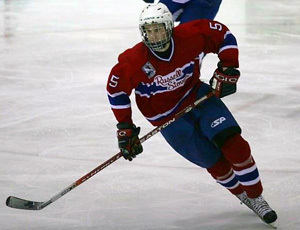 Besides playing Midget hockey, where he scored 40 goals and 92 points in 70 games for the Russell Stover club, last year Winkler also suited up for his native Norway in the Group B World Under 18 Championships, which is one rung below the top-tier teams. 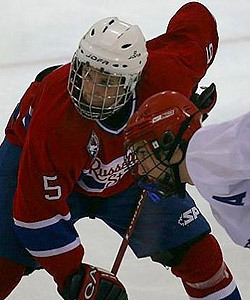 Winkler’s outstanding performance in that tournament, where he led his country in scoring and finished tied for second overall with seven points (two goals, five assists) and a + 6 plus/minus rating in five games, helped Norway win the championship and earn a promotion to the top level next season. It also opened some scouts’ eyes about what he could accomplish on a bigger stage. Even though he lived his entire life in Norway before last summer, you wouldn’t know it to talk to him, because Winkler speaks perfect English. His father is Canadian (hence, the non-Norwegian name) and speaks both English and Norwegian, so now Winkler does, too. 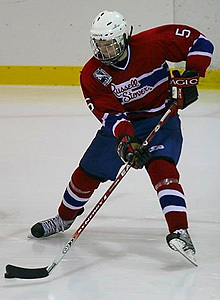 Because Norway doesn’t have much of a track record producing NHL players (there have only been four, including physical defenseman Ole-Kristian Tollefsen in Columbus currently), Winkler decided his best option for eventually making it would be to continue his development in North America. Last year was his first time moving away from home, and the adjustment to life in a foreign country took somewhat of an adjustment - but at least he already knew the language. Next season, Winkler will skate for Cedar Rapids in the USHL, the top junior league in the US, before going on to Colorado College in the fall of 2009, where he has already secured a scholarship. Many players are taking that intermediate step of playing in the USHL first, and it should help the development of a player who would otherwise be making a huge jump from Midget to NCAA Division One. Fellow Stars prospect Richard Bachman, a goaltender selected in the fourth round (120th overall) in 2006, played in Cedar Rapids in 2006-07 and last year was a freshman at Colorado College, so he’s already traveled the exact route Winkler is embarking upon. He had nothing but positive things to say about the process. Clearly, Winkler will not be suiting up in a Dallas Stars jersey for quite some time, but the hope is that, given ample time to learn and develop, he can harness and refine that potential and grow into a key player down the line. He demonstrated that he already has the proper attitude when acknowledging that he has a lot of room to improve and that last week’s camp was the first step in that lengthy process.